Every time I'm starting a new illustration I like to warm up by doing loose sketches. One sketch, one layer. One idea leads to the next one and I end up with 8 or so layers with doodles. Many times, that layer 8 is THE layer, the beginning of my final illustration. What happens to layers 1 to 7? Well, they get tossed... But not anymore! In this time of recycling and reusing I cannot let those poor layers go to waste. I've decided that before deleting them from the original file, I'm going to save them in a smaller format and "finish" them. The quotation marks imply a sketchy finish, rather than a full-colored painterly looking finish. Loose and fun. 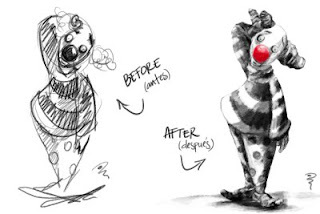 This is the "before and after" of a sad looking clown. Here is to Layer 5, cheers! I love this clown...a good drawing should never go to waste! oh how fun, so glad you shared your process, its a beautiful sketch. Wonderful! Love how you get those brush textures!